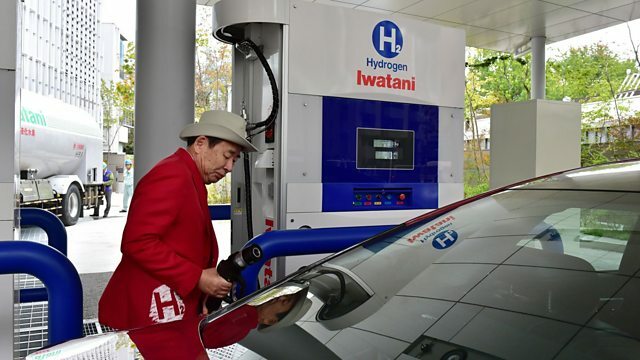 Is the dream of a hydrogen-fuelled zero-carbon economy achievable? Presenters Justin Rowlatt and Laurence Knight ask where the hydrogen will come from and how we will store it. Professor Andrea Sella of University College London blows up a hydrogen balloon, while Professor James Durrant of Imperial College explains what an artificial leaf is. In India, Alok Sharma of the Indian Oil Company gives a tour of their hydrogen refuelling station and fuel cell research centre. And Ned Stetson of the US Department of Energy explains why the vexed problem of containing all this hydrogen is forcing them to resort to "complex anions" and other obscure chemistry. Greece: Here We Go Again!